Lime is a hybrid citrus fruit, scientifically known as Citrus aurantifolia, belongs to Rutaceae family (citrus family). Lime is a evergreen tree which is typically round, lime green and having 3-6 centimeter in diameter & growing between 6 to 13 feet in height containing acidic juices a vesicles. Lime tree is short, bushy and has dark green leaves with white blossoms and green oval fruit . It is native to Southeast Asia and also cultivated in Egypt, Asia etc. 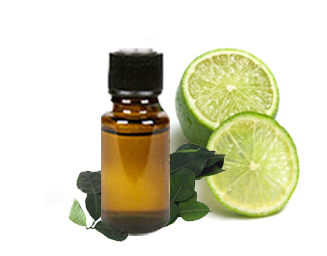 Lime oil stimulates refreshing properties. Lime oil is extracted from fresh or dried peel of lime either by cold pressing or by steam distillation method. Lime oil is either pale yellow or light olive in colour, sharp citrus smell and very sweet, fresh & tart. Lime oil is blends with citronella, clary sage, rosemary, lavender, neroli and ylang ylang oils. It is composed of α-pinene, β-pinene, myrecene, limonene, terpinolene, cineole, linalool, borneol, citral, neral acetate and geranyl acetate. Lime oil is used as ingredient in pickles, jams, marmalades, sauces, squash, sorbets, desserts, beverages, cosmetics and other industrial products. It is also used as vaporizer as it can relieve stress, exhaustion and anxiety or calm mind. It is used for treatment of bleeding, cut and wounds as it promotes the coagulation of blood or contracting blood vessels so it can stop bleeding.